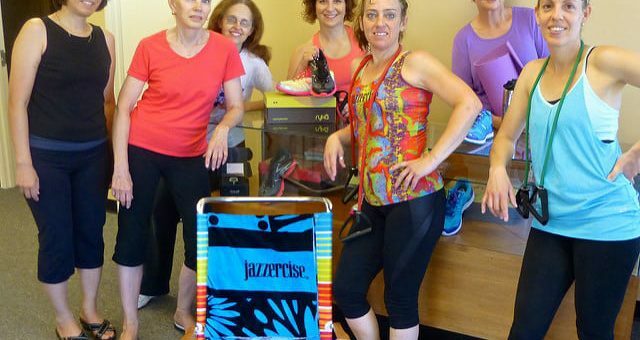 A few years ago Zumba was the major craze, but sure enough, many people are migrating back to the well known, over 50 years, Jazzercise. Jazzercise just goes that step further into the whole mixture which is a blend of jazz and exercise for strength and fitness. Jazzercise, in short, is a dance workout that combines jazz dance routines with pilates, yoga, kickboxing, and other strength training routines. Jazzercise offers a full body workout that conglomerates strength, dance, and resistance training with popular music to soothe the soul. It will reduce your risk of heart disease. You will have plenty of energy. You will become more fit and flexible. The routine exercises every muscle group in your body. Jazzercise reduces stress and makes you happy! You can look forward to some weight loss. Have fun with other women. Here are a few Tips to follow when choosing the perfect Jazzercise training shoe. Look for a shoe half a size up or with larger toe room, as with dancing your foot will inch forward a bit with some moves. Make sure that the shoe and the sole is flexible, particularly between the heel and the ball of the foot. A split sole shoe is ideal in this regard. Always remember the lighter the shoe, the better. So look for a lightweight design with breathable mesh uppers. There will be plenty of impact on your feet, so make sure you have ample cushioning and shock resistance. A rubber outsole that offers good traction with a pivot point is perfect for Jazzercise training. Extra support and a secure fit are crucial to prevent injuries, so look for a heel clutching system or a snug and contoured fit. In the end flexibility and lightweight is key in any dance shoe! Traditionally this is a cross-training shoe, but I have chosen the Asics Tempo for its exceptional shock absorbency, and its lightweight construction. Gel cushioning for exceptional shock absorbency and support. A seamless interior that will not cause chafing and blisters. Excellent traction from the rubber outsole. The Ryka Influence is one of the top high-intensity fitness and dance training shoes today, ideal for Jazzercise, it has all the characteristics that you will ever need. A roomier forefoot and a narrow heel for the ideal combination of stability and freedom of movement. There is an increased instep volume and the footbed offers a more secure fit. Comfortable and breathable uppers with an ergonomically designed sole and pivot points. Well cushioned for good shock absorption and comfort. The Bloch Boost is an absolute all in one dance and dance training sneaker that sports all the features that you will require for comfort, as well as performance. Fabric and textile uppers that are breathable and lightweight. The rubber outsole is non-marking, lightweight and features excellent arch support, as well as spin spot for 360-degree turns. A compression molded EVA sock liner with a Dri-Lex lining offers breathability and mildew resistance. A suede heel grip and D.R.T cushioned heel for optimal shock absorption. A fun and functional dance sneaker, ideal for jazzercise and similarly zumba training. Breathable and lightweight synthetic and mesh uppers to keep you dry and fresh. The neoprene inner sleeve offers plush comfort and support. Constructed to be flexible for easy movement and fast lateral movements. Available in many stunning brightly colored design options. An excellent choice in both a dance and training shoe, Ryka offers some of the best available dance training sneakers that you will find. Features a narrower heel and more secured footbed to offer you a snug and secure fit, while still not impeding movement. The forefoot is roomier for relaxed toes and flexible movement. Available in four bright color designs to choose from. Just as the name says, the Capezio is a Fierce dance sneaker ideal for Jazzercise, jazz, and even Zumba training. This is one of the best dance sneakers that you will find when it comes to comfort and versatility. Features a split sole that is ideal for pivoting and springing, with an arch support system. PU Nappa leather and mesh uppers that are lightweight and breathable. The outsole is manufactured from PU materials and features patented flex points with a forepart spin spot. The tongue and collar are padded with an additional Achilles notch. You can similarly look forward to a plush cushioned and removable EVA footbed. At the end with any dance or dance fitness training, you are going to be springing and pivoting, so the last thing you need is a shoe that will drag you down. As you can see with our picks, a lightweight, breathable shoe that offers stability without restricting your mobility is key.